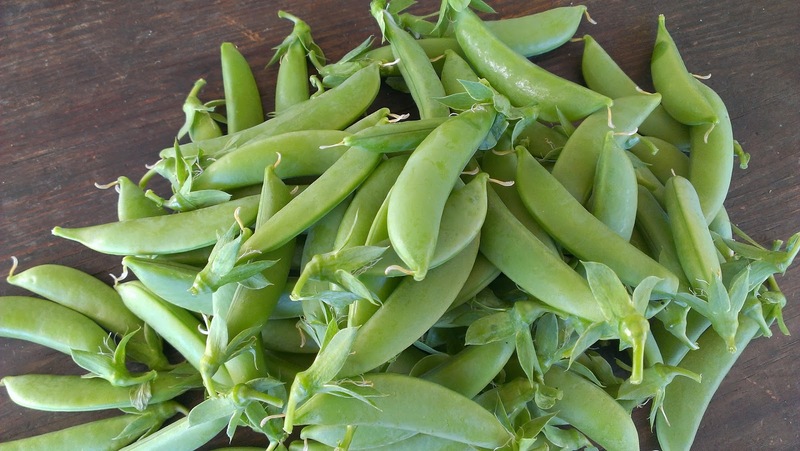 This blog once described my veggie garden adventures in suburbia. Now, these city folk have moved to the bush. There will be veggie dramas, encounters with wildlife, efforts at conservation and tales of our local area. and sugar snaps gathered in t-shirts along with a breakfast's worth of strawberries. and I have pulled the first of my garlic. I am not sure that I should have pulled them yet. 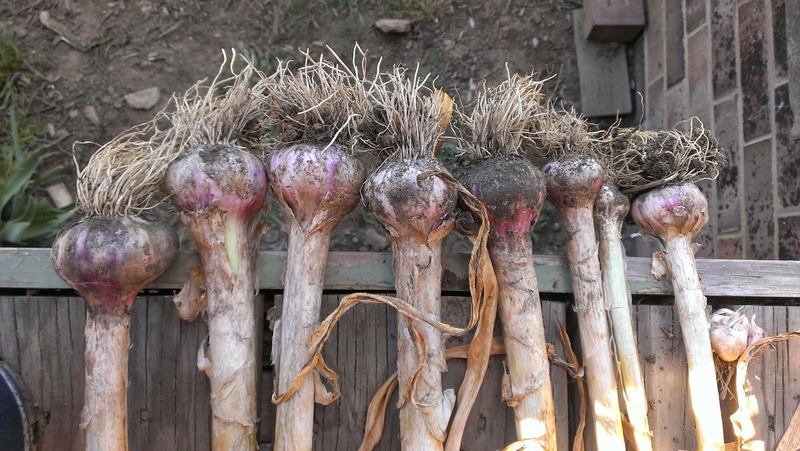 This is the first year I have had any success with garlic and I might have got carried away and pulled them too early? What do you think? They are Purple Monaro. They are looking quite sad in their bed. Their leaves are drying off from the bottom and their tops look like they are yellowing too. They don't seem to be responding to the water I give them from time to time any longer. I put them in at Easter I think, so well before the recommended planting day of the winter solstice. I guess it makes sense then that they'd be ready before the summer solstice? 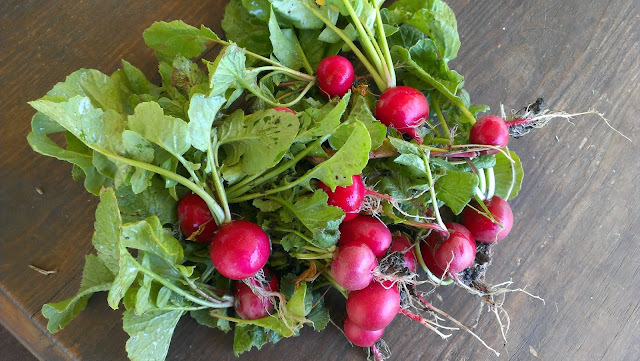 The only other harvest of quantity has been some radishes. 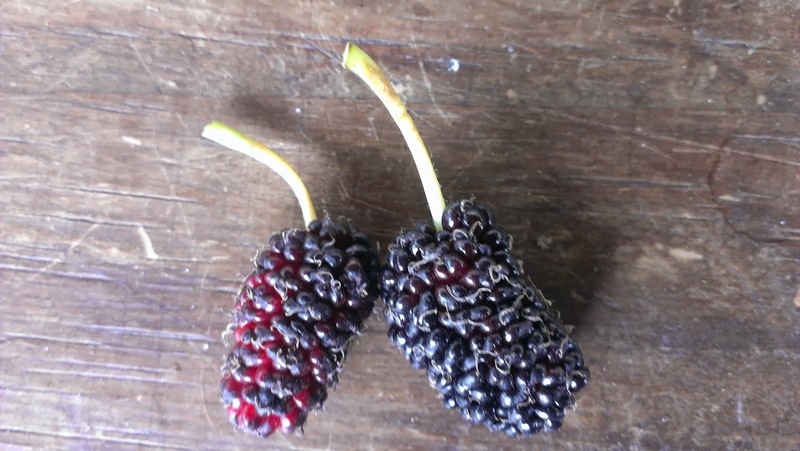 Finally, this week I harvested my first harvest from my fruit trees - two little mulberries. They are tasty but quite dry. I am thinking that the mulberry needs a lot more water? Or perhaps it's just struggling with it's first produce? I am contributing this to Daphne's Harvest Monday. Pop over to hers to see other people's harvests. 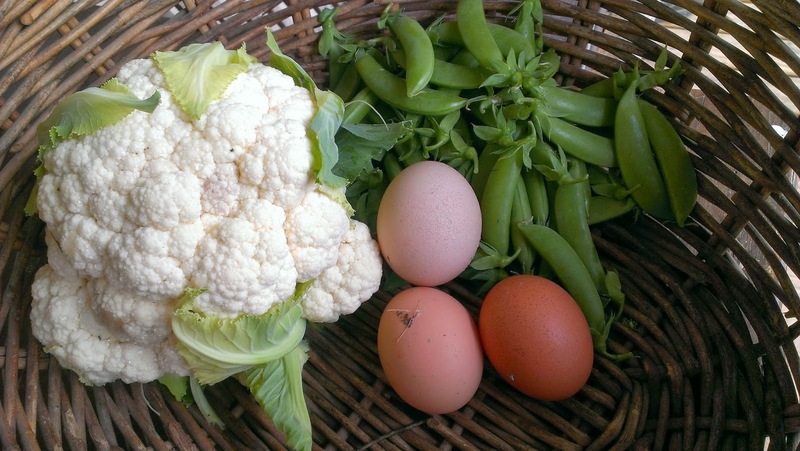 Fab harvests - I do love a good cauliflower and yours looks sensational. As for the garlic - it looks pretty good. Have all the cloves separated nicely? If the tops are yellowing then its probably about ready. You can leave them in until they die back completely. My dad often does that but I tend to pick mine a bit earlier than he does - ie when the tops are yellowed. Having said that I think Purple Monaro might be a hardneck which is generally ready when the scapes twist downwards I think - I'm sure someone with more experience with growing hardnecks than me will be able to describe it far better than I can. 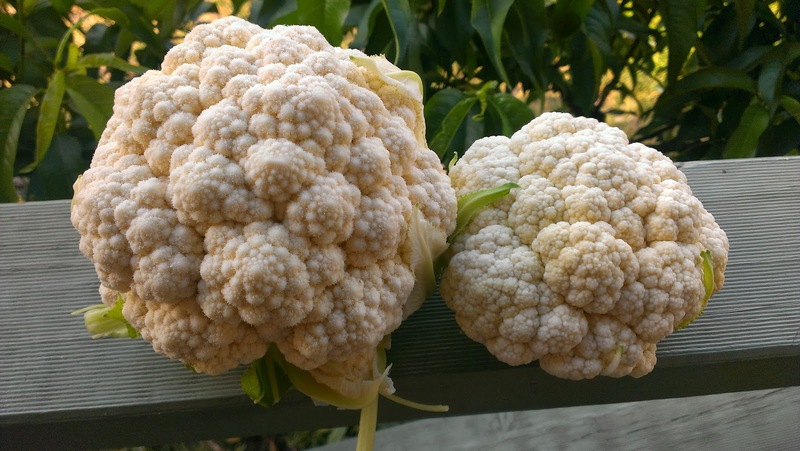 Wow, so much cauliflower. I'm jealous! 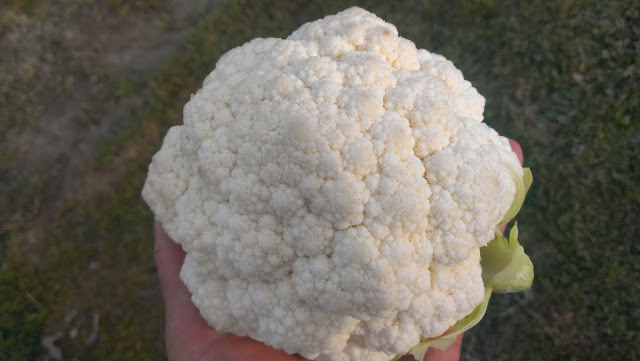 My cauli growing skills still need some working on as my harvests have been pretty meager. Your garlic looks good to me! I'm going to be possibly harvesting mine this weekend if it all looks good. The trick I've been told is when you have yellowed leaves but about 4-5 still green ones that's when you should harvest them. But I don't know if this is for all garlic or hard/soft neck types. Or even if it works at all... The beans look great too. Cauliflower is a great glut to have. 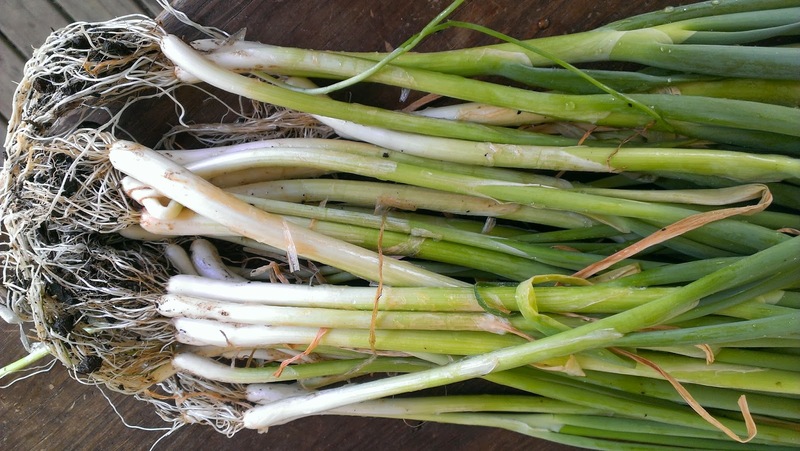 Your spring onion haul is also mighty impressive. Not sure about the mulberries, but I wouldn't think it would have properly established its root system yet. I think it will improve over time. Your garlic looks just fine! Some of mine are doing weird things - like producing additional bunches of leaves. I pulled one today and it has developed side bulbs. The original leaves haven't even died down. Erk. Not sure what to do - perhaps pull them all and mourn over them like I did the bolting onions. Ah well, such are the joys of veggie growing. 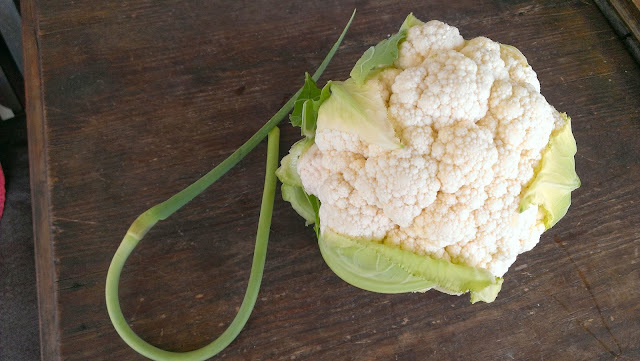 I'm going to email you a cauliflower recipe that is too long to reproduce here. I'll send it to Liz as well, as she might like to try it too. 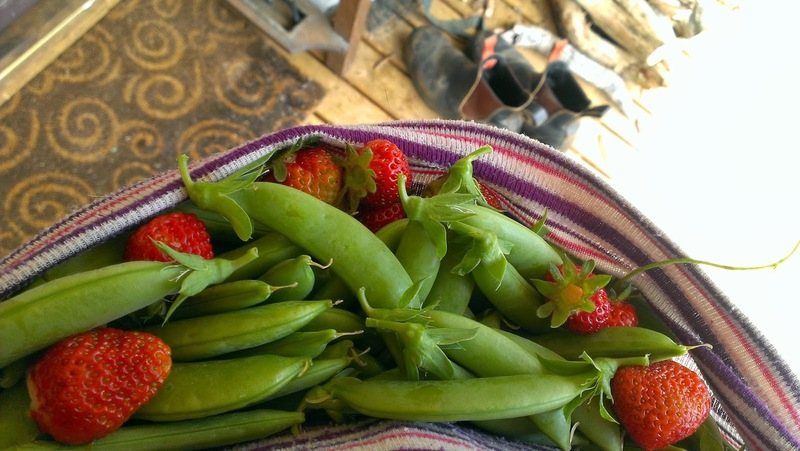 Love the idea of picking strawberries by the handful for breakfast, wish I'd got around to planting more!! Breakfast Twitch at Highfield - you're invited! A Turkey of a Turkey? Protected potatoes pushing up powerfully!